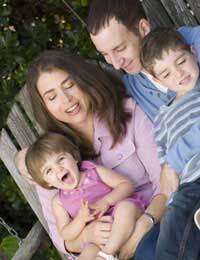 In today’s busy world there exists a good chance that many families aren’t even all together in the same room once a day much less that they are actively planning family activities, sharing the events of their days and generally communicating and remaining close. On the one hand this is a fact of modern life, but on the other it is a sad reflection that many family relationships could do with a little improvement. The good news is that it takes little effort to strengthen family relationships, and usually it produces long-lasting results. Daily, or at least weekly, family meals. Board game evenings in which every member gets to choose a board game to play on a rotating basis. Film evenings in which every member gets to choose a film to watch on a rotating basis. Nightly bedtime or bath-time stories to be read aloud. Weekend activities such as visits to the park or playground. Special family visits to children’s museums or theatre productions. Always use a respectful and appropriate tone of voice when speaking with family members. Never interrupt a family member when (s)he is speaking. Refrain from insulting or gossiping about any member of the family. Avoid using strong language in front of children. Encourage children to share the events of their days. Ask leading questions that will help get to what children are thinking or feeling. A weekly “breakfast for dinner” or “kid’s cooking” night. Hosting a family party for a less celebrated holiday like Arbor Tree Day. Special Saturday morning routines that do not involve hours of television. Baking Christmas treats together to give to friends and family. Always making family birthday cards by hand. Setting family resolutions each New Year’s Day. Requiring radio accompaniment for whoever is washing up the dishes. Strengthening family relationships will take time and patience, and each family will have different weaknesses on which they must work. Common means of strengthening family relationships is to spend more time together, communicate more effectively with each family member and set family traditions to make everyone feel as though they are a part of a special group. In time, each family member will realise how precious their family relationships are and strong bonds will be the norm rather than the exception.